The Four in Hand Hotel is located on the corner of Sutherland Street and Elizabeth Street, in the inner city suburb of Paddington. This historic hotel has been the subject of plans to convert it into a private residence. 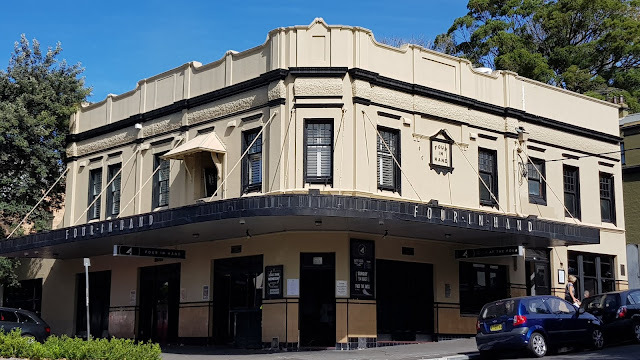 Following protests from local residents, the local council has placed a conservation order on the building and applied for a heritage listing to save it. Linked to: Wordless Wednesday, Wonderful Wednesday, Wednesday Around The World, Travel Photo Thursday, All Seasons. Lovely photo of this unique style architecture ! That looks like a cool little hotel. That would be a fun place to stay, I'd bet! But hoping it will remain a pub and not drastically altered into a residence. That's a handsome building. Hope things work out for the local residents. Interesting. If it remains as a hotel/pub, is it more in jeopardy than if it is transformed into a residence? I don't think it would be in jeopardy because it has a well known restaurant and chef on hand and has a good reputation.